Now that the full time census here is three men and one woman- at least until next week- there are some obvious points to be made. The Sheehan Men. They like sports. Four days of US Open Golf on TV can drift into five and not just because of rain delays. And that’s a sports joke that I can only make because of an epic amount of golf viewing last weekend. The Sheehan Men. Their obsession with little white dimpled balls is not just an arm chair activity. They plan to play 54 holes of golf this Saturday with a 4:30 am departure from the farm and a first tee time of 6 am on their favorite gold course in southern New Hampshire. I think the dogs and I will not see them off. Probably will be asleep when they return too. The Sheehan Men. Because when golf in all its variations is put on the back burner, there is always soccer. A crowd (of men needless to say) is gathering at 2:45 today in front of our TV for the US versus Spain game. Apparently its not often that the US gets to be trounced by the best team in the world- only, like, every time they are in a tournament. But who is quibbling? 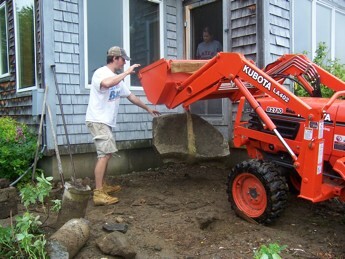 Because the other thing about the Sheehan Men is that they haul rocks. Lots of them. Even Will (whose main job is eating) found time to carry rock this morning in between bowls of ice cream. Not only do they haul rock, but they place it nicely. And they even look cheerful while heaving solid granite around as if tossing feather pillows. But then, the smiles could just indicate they know game time is now only an hour away. StoneWORK with Ben, Bon Voyage to Emily! 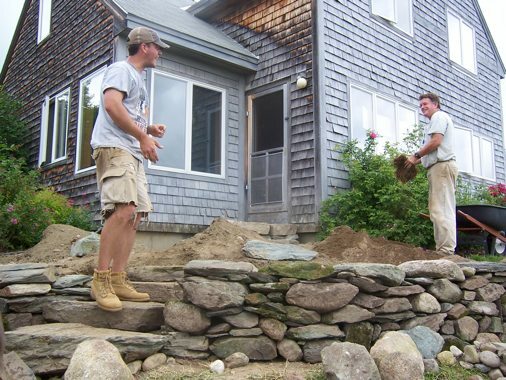 During an exuberant moment, Jim and I decided to take down the deck that has long graced the south side of the house to make a stone patio where it had been. We realized that the deck somehow removed and cut us off from the gardens and being at ground level would be better ( that and the twenty year old deck was beginning to rot). 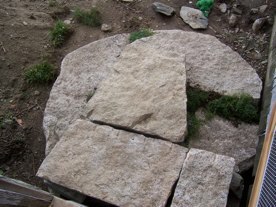 Ben, who has had a lot of experience with stone masonry, agreed to be the brains and the muscle on the project. As we have all these rocks from the foundation of the building we tore down last fall, we are particularly excited to put them to use. You can’t just leave rocks lying around in New England can you? They SCREAM out to be made into walls, steps, and stuff like that. In the first flush of the project, Ben took down the wooden deck. 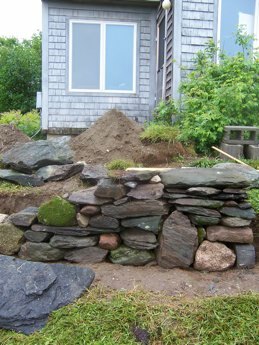 Then, with a neighbor’s tractor, he moved immense stones up to the farm to build an unorthodox set of circular stone steps for the back door (because even our stonework has to involve curves). 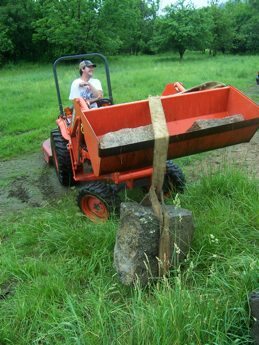 Ben learned how to move big rocks when he worked with a Japanese garden designer miving many ton rocks into a very elaborate Long Island garden. 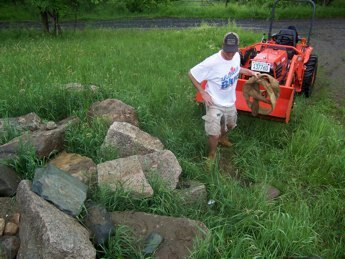 It was impressive to see him finesse these stones into place. Apparently they were paltry pebbles compared to the Long Island project rocks. Here Ben swings the first rock into place. Here May May vies for the role as alpha dog of the project. The steps take shape. 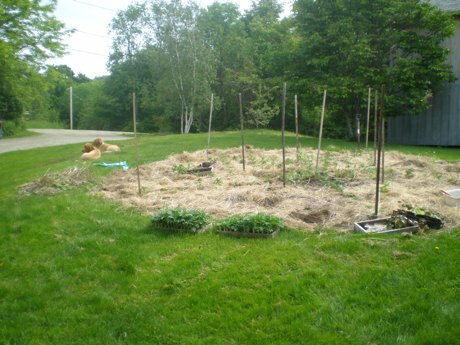 ( No shot of the moment when the tractor (in gear and with the parking break on) rolled down into my perennial beds. 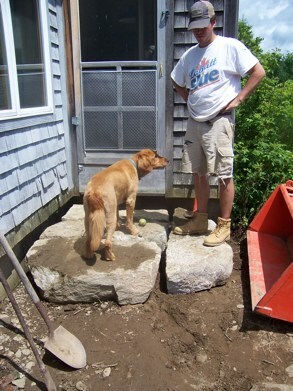 Now Ben has begun work on a retaining wall around the new patio area. What a blessing he likes stonework as well as web site work! And speaking of blessings. Emily has been my rock in the gardens this spring and I want to give her a heartfelt shout out here before she departs tomorrow to work in a summer camp on Cape Cod. EMILY!!!!!! We will miss you! 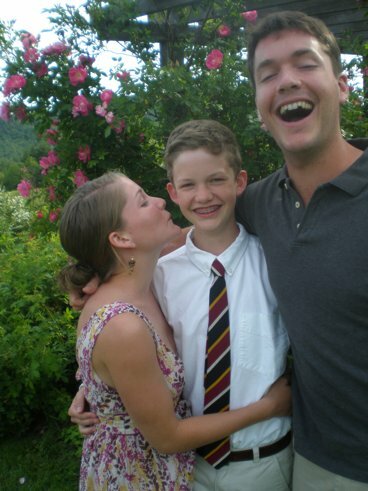 Since Lizzy is on the Camino again, Emily is leaving, and Ben is going to finish this wall then head off to the Camino also (It appears to be contagious, this Camino thing), this leaves Will who graduated from eighth grade on Wednesday. He now faces a summer solo with his parents and other household animals. Here he is right before his graduation in the official baton passing ceremony. William, how do you feel about weeding, deadheading, mulching, lawn mowing, rock moving? Oh YOU feel called to the Camino too? I can’t blame you! 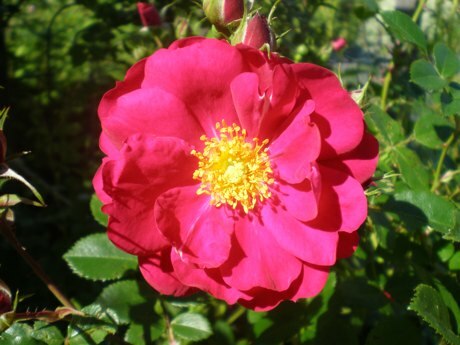 During the last couple of days Roses have begun to fill the gardens. Here’s a quartet that are bringing us pleasure. 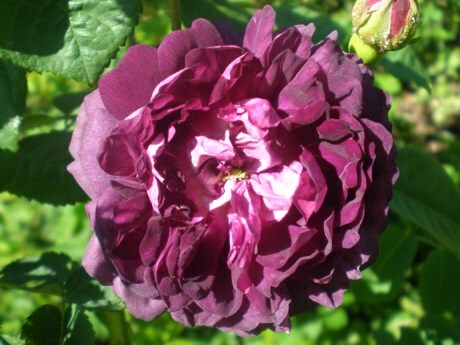 Cardinal de Richelieu Rose, a key ingredient in “All Ego Contracts Null & Void” and a dynamo in its own right. 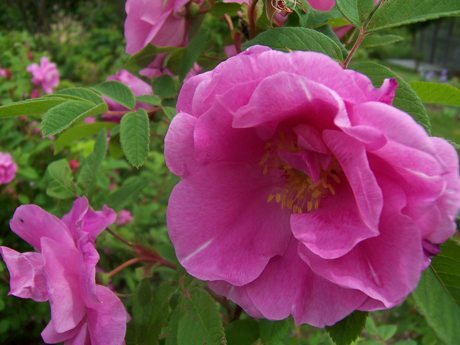 Will Baffin, one of the climbing Roses in “The Sacred Masculine” mix. 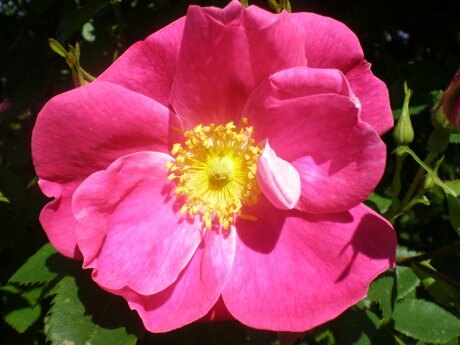 Last for today is Alika Rose which anchors the corner of the Rose Garden. 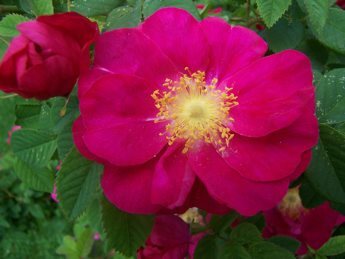 It nearly glows in the dark with such an intense energy and brilliance ( totally lacking in this picture- I begin to think I should only photograph Roses in the rain so their true colors can be seen). I said I would try to keep you in Roses, so I will post this missive before doing another on our stonework project masterminded by Ben. Right after I first posted this, I found this photo of Alika Rose taken on a cloudy day this week. Such a better representation of its saturated color! Let it be a reminder to me to follow through on taking these pictures with clouds and rain or early dawn light only! On Monday, I finished planting all the gardens. EVERYTHING IS IN! My last task was to plant a bed of “Elfin” Thyme down on the spot where we tore down the old house last fall. As a planted this spiral of baby Thymes, I imagined the plants filling in to form a solid bed of magenta blossoms and humming honeybees. As the last plant was dug in, I was happy to see rain clouds hovering to the southeast and with this promise of precipitation, I went home to wait for this much needed rain which fell gently all yesterday. So yesterday was a rest from gardening. 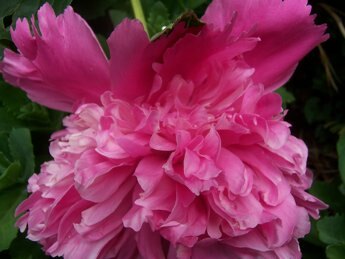 It was a treat to have a day in which I had no role in the gardens but as observer. A mini break holiday before other jobs of summer call. 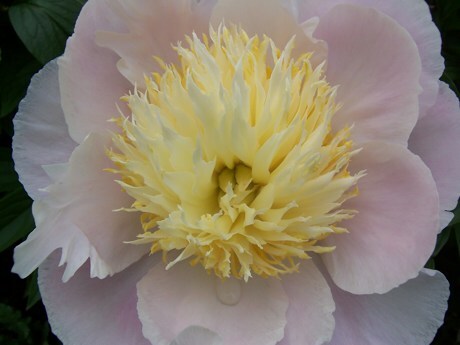 A chance to wander in the soggy gardens and realize that while I used to have a lot of opinions about peonies back in my twenties, now I love them all. I even love the bomb types that, somehow, I found over the top earlier in my life as a gardener. Tomorrow it will be time to begin projects like deadheading all the lilacs, weeding the blueberries, and other jobs that never got done in April and May. 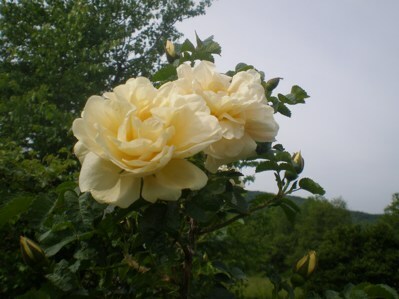 But yesterday and today I just enjoyed the early roses and other June beauties. 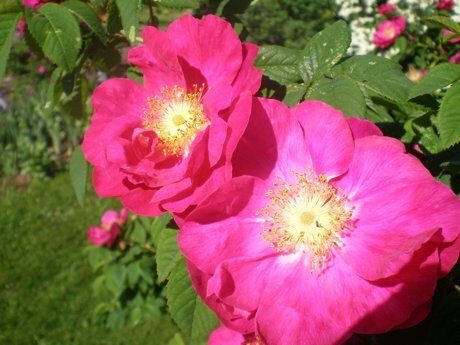 The great thing about spring and summer is there is never really a moment to mourn the passing of one magnificent blooming plant because others are following with their own radiant show. 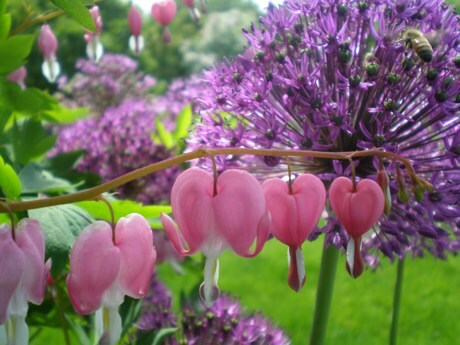 As we bid goodbye to such spring lovelies as Alliums, Tree Peonies and Bleeding Hearts. 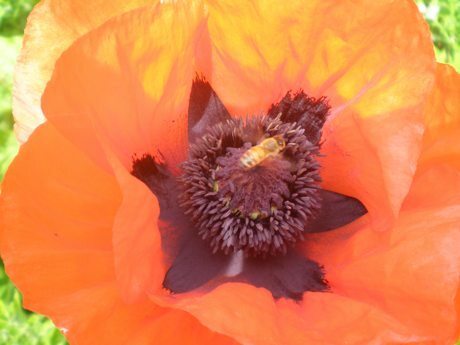 We are greeted with the arrival of Roses, Iris, Poppies and so many other beloveds. Much as I would like nothing better than to keep my nose buried in the Flowers like the honeybees, I’m not quite finished with planting the gardens and must take myself elsewhere. My last two big planting projects this week have been the Red Shiso and the Venus Garden. During the last couple of days, Emily and I planted the Red Shiso. This is a very frost sensitive plant so we wait until we are pretty sure there won’t be any more frosts before sowing this seed. It is the one crop that we can’t manage without so everything to do with the Shiso gets a lot of focus. This is true of the Venus Garden too because of its cutting edge role in our Flower Essence Collection and the way this garden takes us forward on our Green Hope Farm camino. 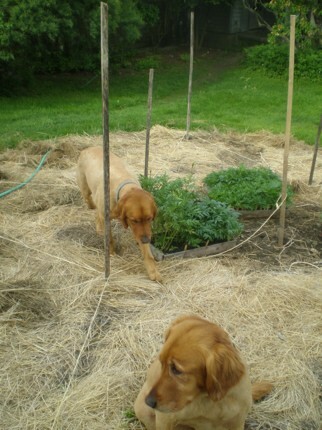 This morning, no one was around to help me start planting the Venus Garden so, while a cardinal bird sang to us, I drafted MayMay and Riley to give moral support. They rose to the challenge and did their assignment of resting nearby with great panache.